The best thing about being a hard partier in my late teen years is that I was not much of a drinker in adulthood. Sure, I’d enjoy a cocktail or two every once in a while, but I virtually never got drunk. By early 2012, back-to-back diagnoses of diabetes and acid reflux had me swearing off alcohol for good, since the hard stuff raised both my blood sugar and acid levels. But when we visited Grey Glacier in Torres Del Paine National Park, circumstances dictated that my old buddy, Scotch, and I should get re-acquainted. It was our first full day in Patagonia with Adventure Life, and our first time venturing into the park with our guide, Matias Espinosa. After spending the previous day driving seven hours from Punta Arenas (on Chile‘s southernmost tip) to our Patagonia Camp eco-lodge, it felt good just to get out of the car and stretch our legs. The wind was brisk, but the summer sun was warm enough that I needed to roll up the sleeves of my jacket. With gorgeous mountain scenery all around us and colorful wildflowers everywhere we looked, it seemed like a perfect day for a hike. Grey Glacier is part of the Southern Patagonian Ice Field, the world’s second largest contiguous ice field outside of the poles. 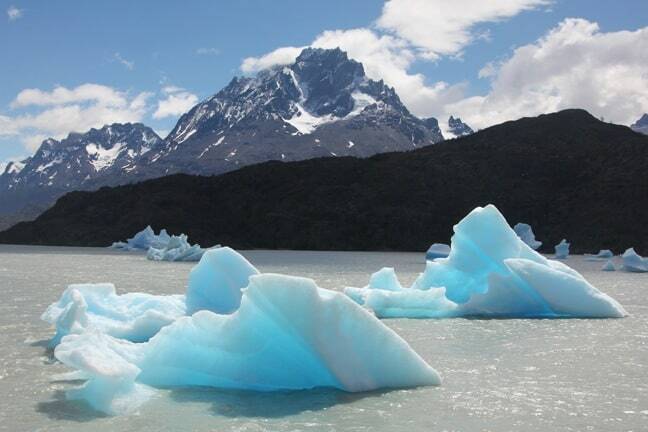 Stretching across the Andes between Argentina and Chile, this 16,800 square km mass of ice feeds dozens of glaciers in Patagonia. At 270 square km, Grey Glacier is one of the smallest in the region. But, as we walked along the shore of Lago Grey, it looked pretty damn huge to us, feeding into the opposite end of the lake. 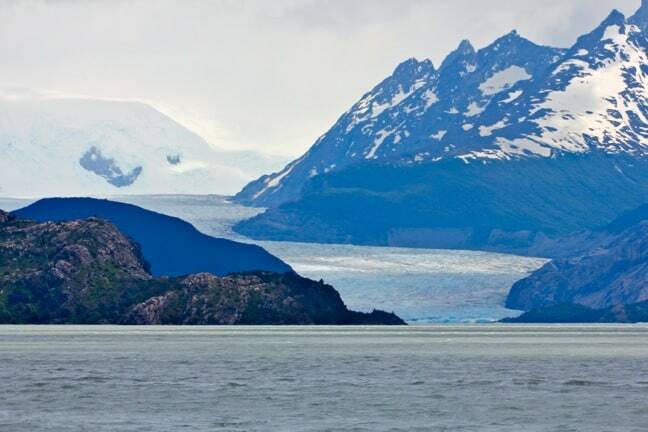 For around $90 per person, you can ride in a boat right up to the edge of the Grey Glacier. But that was too rich for our blood, so we were content to hike around the edge of the lake to get a better view of the glacier, and the many icebergs that had been calved from it. Since I’d never seen icebergs in person, I was just as excited by them as I was by the glacier itself. As the clouds began to part and the morning sun emerged, the icebergs began to glow with a brilliant blue hue that seemed to radiate from within. Blue ice is formed from the compression of pure snow, which ultimately develops into glacial ice over hundreds of years of extreme pressure. This process eliminates the air originally caught in the ice when the snow fell, leaving very little reflective surface for the light from the sun. So, when sunlight hits an iceberg, the light is absorbed, and what little light is refracted appears blue (or blue-green) to the naked eye. I was spellbound watching these massive geometric wonders changing color as the shadows and light shifted. They looked like massive floating gems, mirroring the majestic peaks of the famed Paine Massive behind them. As we rounded a curve in the hiking trail and began to descend a small hill, we found ourselves in a cove where the icebergs were so close it felt like you could jump on one and go for a ride. We noticed a small group of tourists enjoying a picnic right by the shore, so we went just a bit further before breaking from the trail and heading right down to the water. Matias opened his backpack and pulled out a silver flask. “You want some Scotch?” he asked with a smile and a twinkle in his eyes. Blood sugar and stomach acids be damned, the answer had to be yes, given the sheer beauty of the setting. “Let me get some ice,” he said, and walked around the shore to try to find small pieces that had broken off from the iceberg. 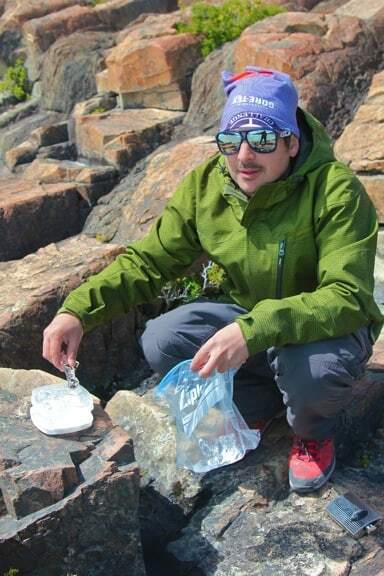 Using a long stick we found in the underbrush, Matias was able to fish a sizable chunk of ice from the Grey Glacier out of the frigid water. He put it into a bag and cracked it into smaller pieces on the rocks, then pulled a container filled with shot glasses from his backpack. 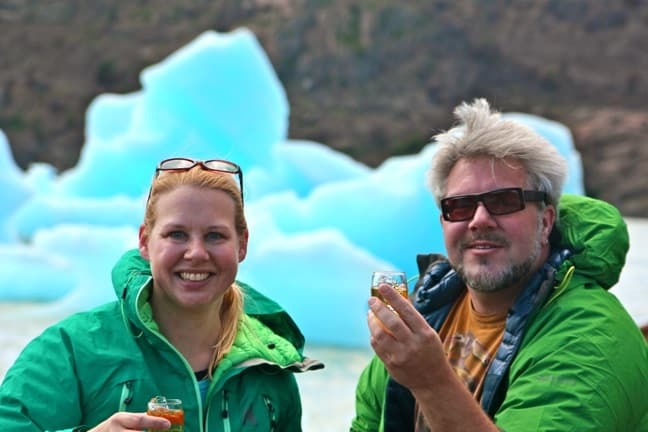 Mary and I sat there marveling at the breathtaking scenery all around us as Matias loaded each glass with a piece of 10,000-year-old ice, then filled it with 20-year-old Scotch. I could count on one hand the number of times in my adult life I’ve had alcohol before noon, but this was clearly a special occasion. Six weeks earlier, we had thought we were done traveling for the year. 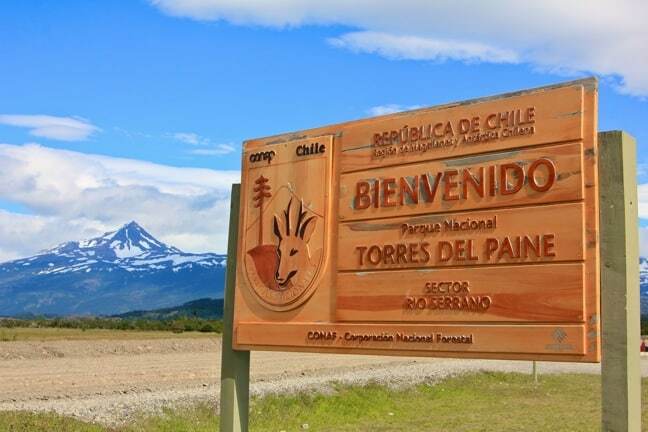 Now, here we were in Chilean Patagonia– a surprise last-minute addition to our eagerly anticipated trip to Antarctica– and we could scarcely believe our good fortune. So we proposed a toast to Matias and Adventure Life for getting us there, to our love and our health, and to continued success for Green Global Travel. And then, we drank. It was just the beginning of our adventures in Torres Del Paine, but it was the sort of moment we’ll savor for the rest of our lives. I don’t know if we’ll ever have a year as full of roller coaster highs and lows as we did in 2012: The year was exhausting, and we’re trying to find a better balance between family, work, home and travel.